A few minutes into conversation with Thavasothy S. Mailvaganam Pillai is enough to establish what an eloquent and erudite person this former teacher and current BAC lecturer is. Visually impaired since birth, this youngest of four children readily admits he was fortunate to have been born into a well to do family, with parents who, upon realising there was something wrong with their baby, immediately sought treatment not just in his country of birth Sri Lanka, but also in neighbouring India and as far away as Singapore and even Australia. ‘Well, I’ve never known what my surrounding atmosphere looks like so there’s nothing to miss but through feel, touch and sound there’s so much that one can glean,’ he says, explaining how he began to deal with his handicap in the early days. The future, however, had other plans for Thava and his family. His engineer father was offered a posting in the Malayan railways, which meant little Thava, who was two at the time, left his birthland to move to their railway quarters in Bangsar. Unaware of schools for special needs children in Malaysia, his parents kept their son at home until the age of nine, but not without home tuition or Indian classical music training at the Sangeetha Sabha in Vivekananda Ashram. Thava has vivid memory of having sung for the superstar Indian actress and renowned dancer, Padmini, and her sister, also an actress and accomplished dancer. Fate, it seemed, was not about to leave Thava to his own devices for too long. The family soon found out about the Princess Elizabeth residential school for children with special needs in Johor and Thava was duly packed off to boarding school. “It was a good experience but still very challenging to be away from my family under the care of new people. Thankfully that was only for a year as my father found out that there was a school in KL called St Gabriel’s in Kampung Pandan that wanted to experiment with a new integration programme, whereby special needs pupils could attend school in a normal environment.” Having completed primary education in St Gabriel’s he moved on to St John’s Boys School in Jalan Ampang, where he continued his education right up to form six. The ambitious young man then completed his Bachelor of Arts in University Malaysia majoring in TESL and minoring in History. Although he studied in the English medium all through, the country was moving towards Malay as the medium of instruction, and to challenge himself, the determined Thava sat for his exams in Malay. He excelled in that too. There’s a special, rather coy smile on his face and spark in his bright intelligent eyes as Thava recalls his years of academic pursuit, from boyhood through his adolescence. If there’s one quality that one can take from this gritty man it is his audacity. “I’ve faced numerous challenges all along; beyond my lack of sight, there’s been this issue of discrimination, but I won’t complain because people take time to understand how I can function or operate efficiently. Doubts and scepticism are only natural. Like I always say what’s life without obstacles. Boring, won’t it be?” laughs Thava. As a young teacher, it was with some degree of nervousness that Thava walked into his first class in SMK Taman Petaling in Petaling Jaya, full of teenage girls about to be taught History by a blind teacher. “I hid my nervousness as best as I could, not just because it was my first formal class but also because it was an all girls school and I wasn’t sure about how to act or react. The girls too I imagine must’ve been curious and perhaps anxious.” So how did the girls react? “Oh, they bombarded me with plenty of questions, as if to test me,” again the happy, carefree laugh, before continuing, “…but we got along very well. Once they realised I could deliver the goods it was alright. The principal at the time too was very supportive, as were the teachers. It was a mutually beneficial arrangement and to cut a long story short, I remained in the school until retirement.” It wasn’t as unadventurous as all that as Thava actually went on to achieve many milestones during the time, including setting a record in 1985 when all 49 girls of his form three class scored a distinction for History in the then SRP exams (now PT3). He was also involved in various co-curricular activities, including as house master and as advisor to the Tamil, English and Foreign Language societies, in which capacity he managed to arrange for Japanese and French classes in the school, probably a first for a government school in Malaysia. “The girls even did Japanese or French cooking and dancing during the school’s annual prize-giving day,” he quips. Another remarkable milestone came in the form of successfully landing a scholarship from the Ministry of Education to do his postgraduate studies in Australia. “I was very fortunate really but even in that joy I was being challenged because there was a new headmistress in the school by then, who… mmmm… wasn’t too convinced about my teaching skills and even wanted to demote me to relieve teaching duties, until her first assistant provided evidence of my past achievements.” Even at this point, the smile on Thava’s face does not disappear. He goes on to explain how his new headmistress made life difficult for him since she did not think he could land the scholarship, hence did not see the point in giving him time off to attend the various selection processes that included interviews and aptitude, language and computer tests among others. Thava did come out tops but by that time, the headmistress was transferred to another school. After two years in Australia, he returned to the same school; and there was poetic justice after all. It’s best told by the man himself. “The ministry had a convocation for all of us selected for the postgraduate programme and they had invited certain heads of schools for the event. And there was the very lady who thought I couldn’t do it, watching me receive my scroll.” This time it’s a no holds barred laughter from Thava. Following that, in 2001, he was the first disabled person to be offered to do a headmasters course by the Ministry of Education, which he successfully completed. 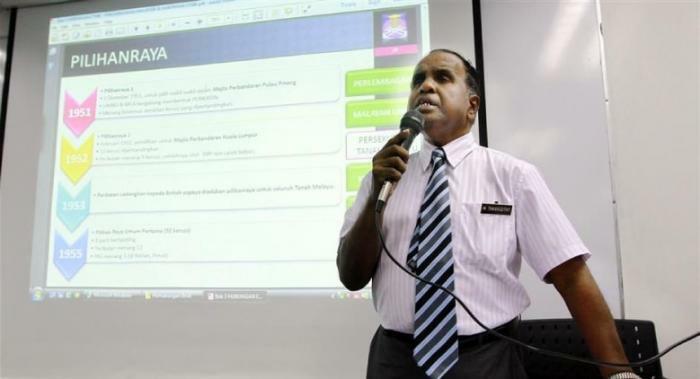 Having won a couple of teaching excellence awards through the years, he was also awarded the Tokoh Guru award by the Selangor government in 2007, the year before his retirement. Thava is also a council member for the Malaysian Association for the Blind (MAB) and continues to contribute in various capacities including as chairman of its library, in Braille production (conversion of normal texts into Braille) and as head of the Braille repair unit. He knows only too well about the lack of material in Braille. “It’s mostly felt when you’re pursuing higher education. You end up needing readers to help you understand better so that you can complete your assignments. It was a bigger challenge with the workload of postgraduate studies but I was fortunate that in both the Australian universities they arranged for volunteer readers to help me. We have such services in MAB too, besides a host of other programmes that we do, including rehabilitation programmes for people who lose their sight in a sudden or after a period of time. These cases are increasing and such people, especially the young ones, need a lot of support.” On a personal front, Thava married a lovely lady from Sri Lanka and they went on to have a healthy son and daughter, both of whom are doctors now. He credits his parents and his wife for much of his success but unfortunately, all three of his pillars of strength have passed away. “They all served me in various capacities to get me to where I am today. There was just so much support and love for me all along. My father, for instance, had planned on returning to his ancestral village in Sri Lanka upon his retirement but he decided to stay on to help me. He was an engineer and in demand even after retirement but he didn’t accept any of the offers because he chose instead to be my reader, driver and researcher of Braille material…so that I could excel in life.” Even at this point, the jovial man does not lose his composure. Let’s not lament petty troubles that come our way. Instead, let’s strive to face them with gusto and etch our names with style. Like Mister Thavasothy S. Mailvaganam Pillai.